Summary: Romance was not part of Nora Grey’s plan. She’s never been particularly attracted to the boys at her school, no matter how hard her best friend, Vee, pushes them at her. Not until Patch comes along. With his easy smile and eyes that seem to see inside her, Patch draws Nora to him against her better judgment. But after a series of terrifying encounters, Nora’s not sure whom to trust. Patch seems to be everywhere she is and seems to know more about her than her closest friends. She can’t decide whether she should fall into his arms or run and hide. And when she tries to seek some answers, she finds herself near a truth that is way more unsettling than anything Patch makes her feel. I know it’s an older book but oh mi god this is one of my favourite books and couldn’t resist reviewing it. From the very start of this book I was intrigued, I mean come on, Nora seems so normal and good then enter Patch the bad boy of the series so it was inevitable that she would fall for him. Fitzpatrick sets up the attraction beautifully between the two characters and the mystery of Patch leaves you wondering what he is hiding. Obviously a book like this is more than just the budding romance, it also has action and suspense in the form of an unknown creepy stalker and who’s the first person to be suspected? Patch of course. Becca Fitzpatrick brilliantly builds up the suspense so we don’t even suspect the real villain but we still can’t condemn Patch completely no matter the evidence against him there is just something about him that is irrisitable to Nora. I cannot describe how amazing this book is to me but it really is worth reading and I would recommend it to anyone. 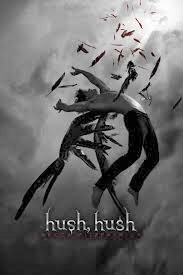 The sequels to this book were great but nothing could ever really live up to Hush,Hush.